Naima Akef was probably the most eclectic of the dancers that I have seen. 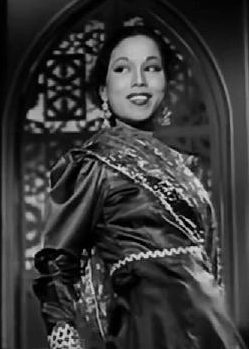 She may not have been quite as renowned as Tahia Carioca or Samia Gamal, but she was certainly up there in appeal, and I have been wanting to write a post on her because some of her dances contained such an incredible variety as well as being excellent and fun. Additionally, she choreographed many of her own dances, and she sometimes even headed a Naima Akef Dance Troupe. I am going to start this selection with her most strange and possibly most modern dance, “Mambo.” As I’ve said elsewhere, I have seen nothing like this before. After that one, I’ve thrown in six more, which fall all along the spectrum from modern cabaret to traditional Egyptian folk dance. Rather than going into any descriptions of those, I’ll let the dances speak for themselves (because they certainly do speak for themselves – and because that means less work for me). By the way, you might notice a different format here, because I have decided to use Vimeo as the source. The first clips are smaller than the latter ones, because that’s the way they come at Vimeo (and I don’t know if there’s any way to change that). Nonetheless, I’m glad that I’ve dipped into Vimeo because after so much YouTube, it seems refreshing, somehow. This post is going to be a little different from what you have seen here in recent months, because I have gotten the urge to throw together some of my favorite contemporary versions of old Hindi film songs. The songs that I am including also come from a slightly wider range than the area that I usually focus on these days, stretching in one case all the way into the early 1970s. But all of these songs were composed by music directors who produced many classics during the Golden Age, and all of them were originally sung by artists who became prominent during the Golden Age or the Vintage Era. I have posted some of these covers before, but never as part of a unified, multi-song theme post. I have also posted collections of contemporary covers before, but this time around (unlike before), I am consciously avoiding the world of electronic club remixes (with their accompanying sleazy videos, etc.). But I am not avoiding electronic music entirely…which brings me to the first selection here. Actually, this is the song that inspired me to put together a favorite-contemporary-versions post. It is one that I discovered very recently, a cover of a song that came out in 1958. The artist covering it is Vasuda Sharma, and you might say that I am pretty taken with her. I don’t like all of the things she does, but that’s because she has such an eclectic repertoire that it would be impossible even for someone like me to like it all. One commonality that you can find in much of her material is her use of technological looping. Actually, she does a lot of live looping. What that means is that she creates a musical sound (often with her voice alone), instantly records it into a looping machine operated by a foot pedal, and lets the recorded riffs or vocal parts repeat and build upon each other while she continues to perform live, record while she performs, etc. There are a few artists who use this technological process now, but at least some try to hide it, while Vasuda actually calls attention to it – in some very fun and playful ways. 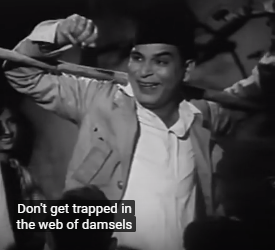 This performance of “Hai Apna Dil To Awara” from Solva Saal (1958) is one place where she does that. It might not be to everyone’s tastes, but I think it’s a lot of fun, and she is brilliant. I consider this next act as being somewhat in the same vein as Tandoori Jukebox – or at least one reminds me of the other to some extent – although these people are much better known. Moreover, I have been a fan of the singer, Najma Akhtar, for about 20 years. Najma is a Pakistani-British singer who gained quite a reputation as a fusion artist in the ’90s, putting out solo albums but also working with some pretty big British rock stars such as Jah Wobble and Robert Plant. (In fact, she was Robert Plant’s girlfriend for two years – but never mind that gossip.) Then, in the mid-late ’90s, she collaborated with a U.S.-based “Indo-pop” artist named Chris Rael, and they released an album called “Forbidden Kiss,” which consisted entirely of music by S.D. 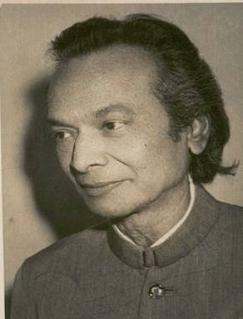 Burman. There are some good ’60s classics on the album and there might even be something from the ’50s or earlier. But I wanted to include a video that shows the collaborative act performing live, and the one that I found is a clip of Najma singing for Chris Rael’s full band, Church of Betty. This song is from a movie that came out in 1971, and it’s another song that will remind a lot of people of Helen. This next cover brings us back into very obscure territory, but it got some nice responses when I posted it a few years ago. I would describe it as a guitar-based folk-rock rendition, and it certainly is a unique way to interpret “Awaz De Kahan Hai.” I wish this version had become better known, because I’m quite fond of it. And I’ll close the list with Suzana Ansar. More than seven years ago, I posted a clip of Suzana singing a one-minute version of “Madhuban Mein Radhika Nache Re” in a small room – probably a hotel room – and probably as a rehearsal for an upcoming show. Now, finally, over on Dailymotion, I have found a clip of her singing the full version on stage. The audio part is far from perfect, because it is cluttered with distracting crowd noises from the performance space. (I am not sure where this is, but it says that it’s for “786 TV.” Well, OK…) But above the distracting noises, you can still hear Suzana’s wonderful voice. She is a Bangla-British singer with some popularity (so I have heard), and that popularity is certainly well deserved.